Just in time for the holidays, a new member has joined Team EOSCU. This team member will focus on morale and stress relief while also exploring new ways to chase balls, nap, and snack. 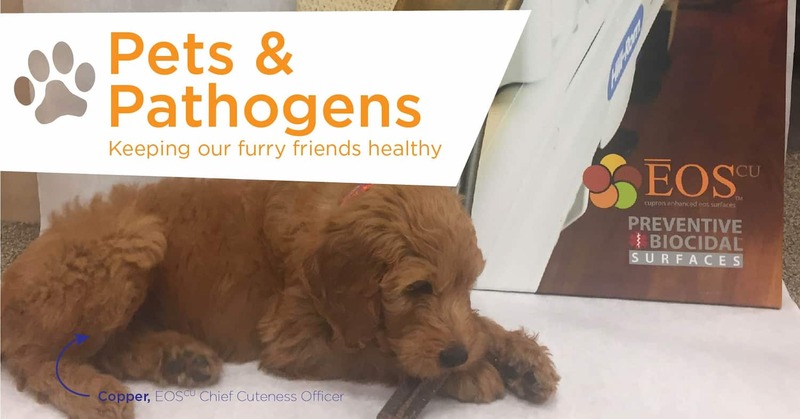 Please allow us to introduce our Chief Cuteness Officer, Copper, a Goldendoodle from Winchester, VA. As new CCO, Copper has inspired us to think about the health of our furry friends, their medical care, and how they have evolved to fight infections as they moved from the wild into our homes. Today’s post will shed some light on how animals join us in the fight against pathogens while also revealing additional opportunities for Preventive|Biocidal Surfaces™ to play a role in reducing the deadliest of those pathogens. Almost half of American households include a pet dog, with more than a third having a pet cat. And like humans, dogs and cats can become infected by the bacteria that surround us, from skin infections such as dermatitis to upper respiratory infections such as pneumonia. However, unlike most humans, pets like to eat random things off the ground, roll in the dirt, and even roll on smelly rotting stuff they find. This exposes pets to an even greater number of bacterial and parasitic infestations. Treatment with antibiotics can help most bacterial infections, and thankfully, there are medicines to treat parasites and many vaccines exist to protect our pets from viral infections. But, just like in humans, the closer animals are in contact with each other, the greater the chances of spreading illness and disease, resulting in outbreaks that are more difficult to treat. For humans, the threat of disease came with the growth of cities: Close physical proximity led to quick and efficient transmission of everything from the Plague to chickenpox. While most pets are kept in homes where they live out their lives in small numbers, some do experience city-like conditions for at least part of their lives. The animal equivalent of cities comes in a variety of forms, each presenting challenges for animal health. Another kind of “animal city” is the zoo. The threat of close quarters has been minimized thanks to changes in zoo design over the past decades, where animals are increasingly kept in spacious habitats rather than confined to pens or cages. Maintaining an animal in captivity always comes with health and medical concerns, however. Without access to the full resources available to an animal in the wild, a zoo animal will have fewer natural options for maintaining health, such as selecting plants or modifying diet in response to how he or she is feeling. (Much evidence exists that shows that wild animals are capable of self-medicating for certain conditions.) But since animals will get sick, zoos also require facilities where they can attempt to treat the unwell and these areas especially must be cleaned and maintain a low bioburden to ensure that transmission rates are also low. Zoos do employ dedicated medical staff to keep animals healthy and animals will even be put in quarantine, just like human patients are placed on isolation, to avoid transmission of infection. The final kind of “animal city” we will discuss in our post is the large-scale agricultural setting, such as pig or poultry farms. These extremely close conditions make health concerns a priority, leading to a great deal of antibiotics use over the past decades. In fact, over one-half of antibiotic use in the US is in animal husbandry. Most of these antibiotics are used as a preventative measure, not in response to infection. This overuse has come under scrutiny in recent years, as the threat of antibiotic resistance has become a significant human concern and use in animals has the same impact on resistance as use in humans. Simply put, exposure of the antibiotic to the bacteria allows the bacteria to adapt and become resistant…no matter how it gains that exposure. New ways to prevent infection, including adapting the physical living conditions of the animals, are being explored as a way to reduce the amount of antibiotics that are used in food animals. Much like learning about the role the physical environment plays in the transmission of HAIs in hospitals, maintaining cleaner facilities and reducing environmental bioburden in these poultry “houses,” for instance, could make a difference and limit the use of unnecessary antibiotics. In order to keep our animals healthy, we should use the same healthy practices as we use for ourselves. Cleanliness is key: Keeping our pets groomed (including those ears) will keep away many threats of infection, especially insect bites, limiting the places that microbes can colonize and infect. Also of significant importance is a clean living space, including crates, backyards, shelters, and any other space used by your pet. Many types of bacteria and parasites thrive in animal feces, so removing waste immediately is vital. Additionally, use of Preventive|Biocidal Surfaces™ could eliminate the threat of transmission from contaminated touch-surfaces. Preventative medical care is essential: Vaccination can eliminate the threat of deadly viruses and medications can prevent intestinal parasites (worms). Very young pets, like our Copper, don’t yet have their full regimen of shots and are therefore particularly vulnerable to infections. Keeping them inside and away from contaminated areas with higher a bioburden is essential until they are fully vaccinated and immune-competent. Rapid treatment can save lives: When infection does take hold and your little guy (or girl) is sick, getting your pet to the vet quickly can help animals recover more successfully and prevent the infection from spreading to other animals. While pets will recover from some conditions without intervention, only a vet can tell you whether their symptoms could be something worse. With our new CCO Copper now a member of the team, we will certainly be returning to the world of pets in a future post. In fact, we plan on discussing that and other matters with him soon. When he wakes up from his nap.